This is such superbly practical advice. It really helps to explain not just the technicalities but also the culture of these tools. It's definitely useful for other sorts of library as well. Printable Paper. You just changed my life forever. Love this--definitely goes for academic libraries too. I did not know about any of the three gems you linked to...but now I do. I'm going to find and follow your library twitter acct so my patrons will as well! Very useful post. I agree with Amanda, this goes for other libraries too. I've been looking for clear advice on using twitter in academic libraries for some time and this is exactly what I was looking for. We've been tweeting for a couple of years. One of us Facebooks and another tweets. We have a complicated relationship with the County Communications Department on how the posts make it to the web, but mostly it works. We can't respond, but for a non-social feed, I think we do ok, https://twitter.com/#!/scgovLibrary. Staff help by submitting posts...which has advantages... if the post doesn't quite work (often they do) the idea can spark something. 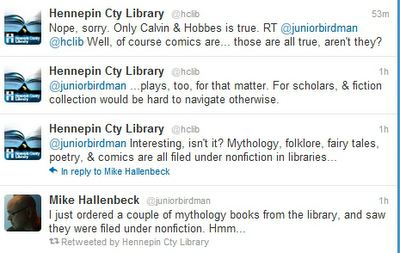 I hope this gets widely spread and more libraries reconsider echoing their FB updates to Twitter. Lots of great advice in here. And thanks for the useful websites--two were new to me. My advice for Twitter would be "be yourself." 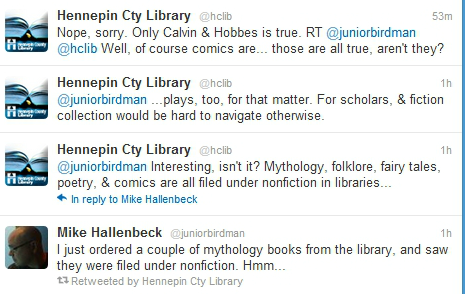 I had a really fun back and forth with a patron about a book this morning on the library's account. Totally tied into our services but it was personal and real. She had posted a reading status about a book I read and had reviewed for the library blog. I replied to her saying I'd read the book and liked it and that I'd reviewed it for our blog and included some fun links in the review. We talked a bit about movies mentioned in the book. It made my morning a lot more fun! Thanks for sharing this great content, I really enjoyed the insign you bring to the topic, awesome stuff! SMViews offer high-quality social media services as an buy twitter followers.